Quality metal fabrication jobs begin with precise measuring and cutting – and at Anglim’s Western Metal Works, we try to utilize the most high-tech tools in the industry to ensure every job is completed with utmost precision. We have one of the only Water-jet Cutting heads in the state, allowing us to offer the newest and most innovative machining solutions for your metal fabrication needs. 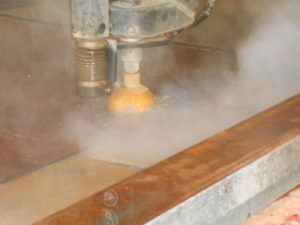 Water-jet cutting offers superior control and safety over other types of machining. The process utilizes high-powered jets of water in tightly controlled streams to cut through metal and other materials. This eliminates the need for heat, friction, and noxious gases and liquids – creating a “green” metal fabrication solution that is appropriate for a variety of industries. You can learn more about the process here. The Maxiem 1530 coupled with the Water-jet cutting head provides the fastest and most precise results compared to any abrasive waterjet on the market. Computer-driven for maximum control and precision, our waterjet can accommodate a range of materials and thicknesses with the ability to control taper, and without the risk of warping and heat damage. Whether you’re creating a piece of metal art or fabricating pieces for clean room technology, precision matters – and that’s why you should count on a shop that utilizes up-to-date machining technology. Contact us today to learn more, or schedule welding and fabrication services. Call 505.822.9170 to learn more about our metal fabrication technology and services.